By April Hunt on Friday, November 20th, 2015 at 12:00 a.m.
Now that’s the kind of sentiment PolitiFact Georgia could get behind. Then we opened the email with that subject line and saw our alert reader meant vaccinations, not Fireball. The question was about a meme that appeared on Facebook and other social media sites in the wake of the terrorist attack in Paris. 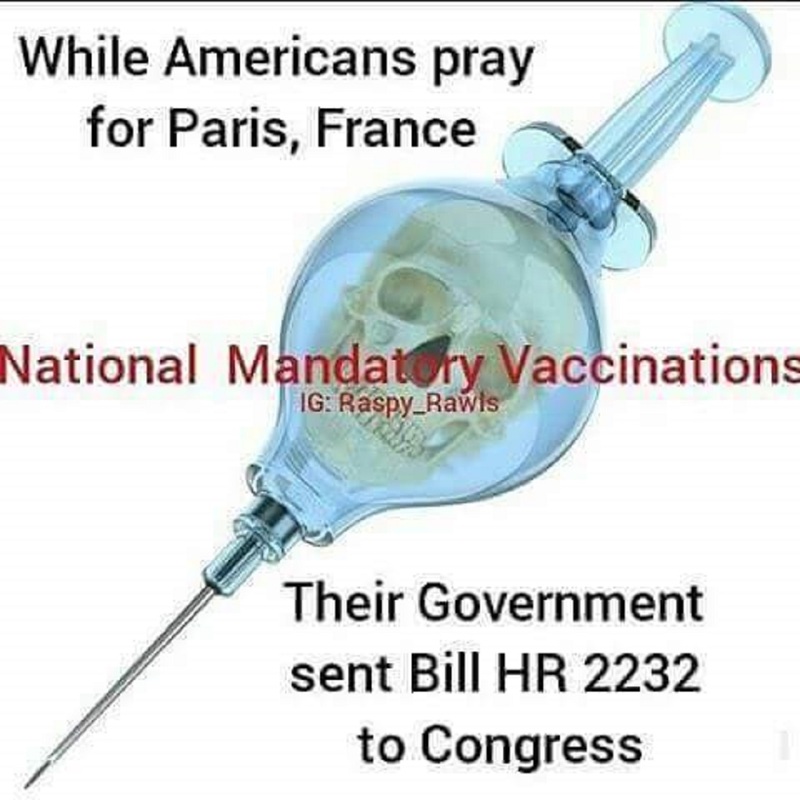 "While Americans pray for Paris, France, their government sent HR (House Resolution) 2232 to Congress," it read. The implication, of course, is that politicians took advantage of an international tragedy to quickly enact controversial legislation (all with a complicit press). Thank goodness for Internet memes, right? To be clear, HR 2232 exists. U.S. Rep. Frederica Wilson, D-Florida, introduced the Vaccinate All Children Act of 2015 on May 1. Her proposal would restrict the federal government from awarding preventive health service grants to state-level entities unless that state required all public schoolchildren be vaccinated. Exemptions are in place, only for medical reasons. While in theory that means it would remain a state decision to enact vaccination rules for public schools, the federal government’s deep pockets have historically brought states in line. The most famous example was the Reagan administration’s decision in 1984 to use of the Highway Trust Fund to get states to raise the drinking age to 21. States that didn’t comply with the new national standard would see 10 percent of their federal highway funds cut. Eventually, every state agreed – and ensured that what amounted to several million dollars in some places would continue to flow. So while the proposal does not officially make vaccinations mandatory, that would likely be the end result if it were passed into law. Except for one major flaw with the meme. There was no movement on the bill since the massacre in Paris. In fact, there hasn’t been any action on the proposal since the GOP-controlled House assigned it to a subcommittee a week after Wilson introduced it. And there likely won’t be. "It’s a Democratic bill, and it doesn’t look like a coordinated move by the Democrats," said Kerwin Swint, chairman of the political science department at Kennesaw State University. "This looks like a lone wolf type bill. It hasn’t moved because it’s not going to." So then why the meme? Several discredited claims about vaccines – most notably the thoroughly debunked link between the shots and autism – reared up again after a measles outbreak traced to Disneyland in California sickened 147 people in the United States. The theme park outbreak – and the first reported American death from measles in 12 years – led to a new law in California that revoked "personal belief" exemptions and required all children in public schools without medical reasons to be immunized. "While I absolutely understand the freedom to say no to healthcare, I don’t think it’s a freedom to extend when it’s to protect your child or to you put others at risk with your choice," said Arthur Caplan, the director of medical ethics at New York University’s Langone Medical Center. "It’s not a bad idea to consider this on a national level." Pushback and skepticism, though, has been fierce, from everyone from Hollywood celebrities who long objected to immunizations to the two physicians running for the Republican presidential nomination. The anti-vaccination movement is one place where the left and right converge and from that, can move onto greater conspiracies, said Mark Fenster, University of Florida law professor who studies conspiracy theories. The Paris attacks, then, are a "false flag," an operation designed by conspiring forces – this time the media, government and pharmaceutical companies – to distract Americans from the goal of dangerous immunizations. A similar "false flag" theory is touted by some in connection with the Sandy Hook Elementary School shooting. There, the conspiracy goes, the government staged a horrible massacre in a bid to take citizens’ guns. "The anti-vaccine movement is obsessed with their fear of vaccines, and they view any government effort to require their use as a threat," Fenster said. "Vaccines may have nothing to do with Paris, but the movement views it as a way to ram through this law while no one is watching," he added. A meme making the rounds on social media takes a different tack on the Paris terrorist attacks. It claims the tragedy has been a distraction to government efforts to mandate vaccinations for all public schoolchildren. There is a proposal for a similar law, but there has been no movement on the proposal since a week after it was introduced last spring. That’s the last bit of truth to the meme. The rest of the message and implication border on the ludicrous. Published: Friday, November 20th, 2015 at 12:00 a.m.